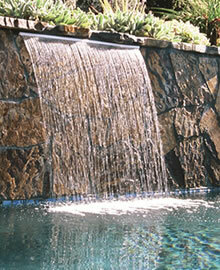 Laminar Jets with LED produce clear or lighted arcs of water as they silently enter your pool or spa. Laminar Jets with LED create spectacular backyard water entertainment with dazzling nighttime lighting effects. Laminar Jets come standard with a built-in 12V LED light module offering vibrant lighting in nine brilliant colors and five festive color shows. Additionally the LED light intensity can be adjusted to your preference. Laminar Jets are also available with a fiber optic module that accepts lighted fiber optics. Laminar Jets interface easily with Aqualink RS and PDA controllers. Multiple jets can be combined and synchronized with Zodiac’s Pool and Spa LED lights. Laminar Jets are also available with the unique Pour-A Lid™ option, enabling easy coordination with your deck finish. Zodiac provides convenient LED lighting upgrade kits for previously installed laminar jet assemblies. Laminar Jets are ready for pressure testing right out of the box, and the canister is equipped with both vertical and horizontal rebar tabs to help align the canister during construction. As an extra layer of protection, Laminar Jets include a unique Finger Screen, which is easily serviceable in the feed line, to protect the unit from debris. Flow can be adjusted with an innovative internal flow adjustment valve conveniently located inside the canister for easy adjustment and tuning.